A friend of mine, Bugs Tan has a great way for inventors and entrepreneurs to evaluate good business ideas. Bugs Tan is an award winning inventor who is very passionate in the field of innovation and entrepreneurship. Based on his experience, he came out with a practical series of questions to help entrepreneurs and inventors to evaluate their ideas. I like these questions as it provides a very good perspective on how an entrepreneur should review the viability of their idea. View more presentations from Uncle Bugs. Do also check out Bugs’s blog to tap his thoughts on innovation. What is a good business idea? 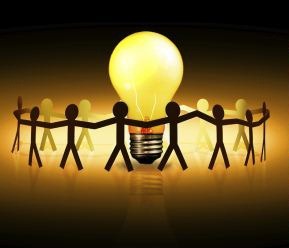 Before answering the question, What is a good business idea? Let me ask you this question, do you need a good business idea to start your business? A long time back, my MBA professor once told me that your business idea do not need a competitive advantage to make money. The class was stunned but in many ways he’s right. There are so many businesses out there who does not have any significant competitive advantage but are making a decent profit. Think of the chicken rice stall near your office. How do they fare compared to the best chicken rice in town? Not good enough i assume. But are they making money? You bet they are. But not as much as the extraordinary money that the best chicken rice stall is making. So, do you need a good business idea to do business? No. You only need a good business idea if you aspire to be the market leader in your industry. A business idea that allows you to earn extraordinary profit. So what consist of a great business idea? In my opinion, the human motivation of avoiding pain and increasing pleasure is a good measurement of an idea. The best ideas generally have a mixture of both. Personally if given a choice, i like ideas that help customer avoid/remove pain. 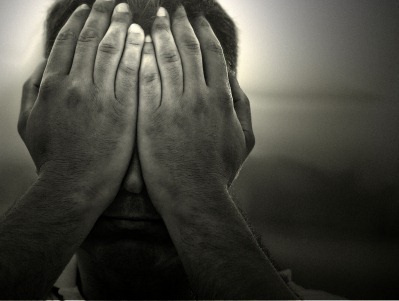 It is just human nature to have a bigger motivation to avoid pain rather than to seek pleasure. The first step, for you to evaluate an idea is to identify the pain point of your customer and think of a solution to solve it. Make sure that the problem is so painful that the customer will gladly pay money to make it go away. (Those are the best ideas) In terms of pricing, you need to ensure the pain removed is bigger than the pain the customer feels when paying you. What about pleasure based ideas? Use the same methodology and identify how you are increasing the pleasure of your customer. Are you creating fun? Are you increasing sales for them? Identify them. Careful though, if the business idea is a pleasure based idea, then you really need to identify whether your product/service is a “nice to have” (massage, spa, manicure & ETC). If it is a “nice to have” then you are exposed to what is called an elastic consumer goods/services. It just means that the higher you charge the lesser demand you have. Elastic goods/services are dependent on the current economy situation. People will cut back if they don’t have enough money and you also face the danger of a price war. Here are some starting point for you to review your business idea. Stay tune for the next post. I’ve been meaning to write more about the entrepreneur scene in Malaysia, but I just can’t seems to find the time to do that. But I would like to share with any budding entrepreneurs that wants to apply for the Cradle pre-seed grant a useful budget spreadsheet. Like any grants, Cradle’s pre-seed grant has rules on what you are allow to spend on. Based on the guidelines for the allowable expenses in Cradle’s website, I’ve devised a template to assist entrepreneurs to plan their expenditure. 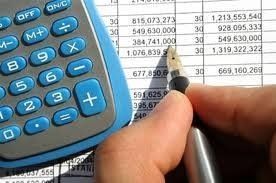 It is based on the allowable expenses stated by Cradle in their website. Download the Cradle pre-seed budget template. P.S: Do feedback to me if you find any bugs in the template. Quite some time back, I wrote about some resources that Malaysian entrepreneur can check out to get their idea started. 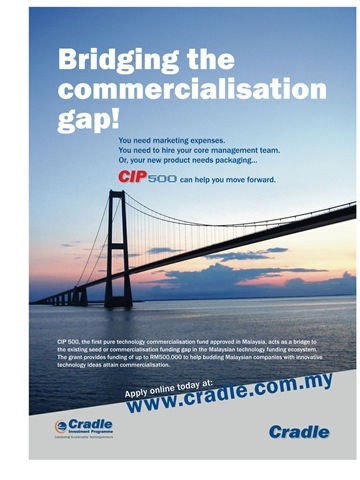 Cradle Funds had just launched its new commercialisation grant (RM 500k) to assist entrepreneurs in their ventures. 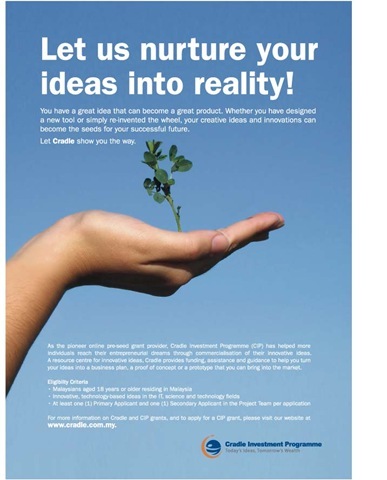 Cradle has 2 grants, one for product development and one for commercialisation. 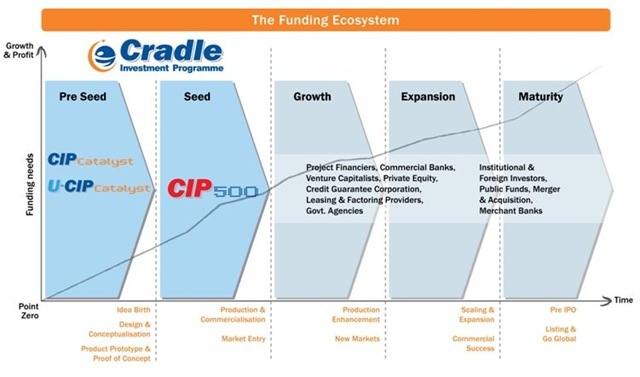 With these 2 funds, Cradle had helped fill some of the gap in the funding ecosystem in Malaysia.